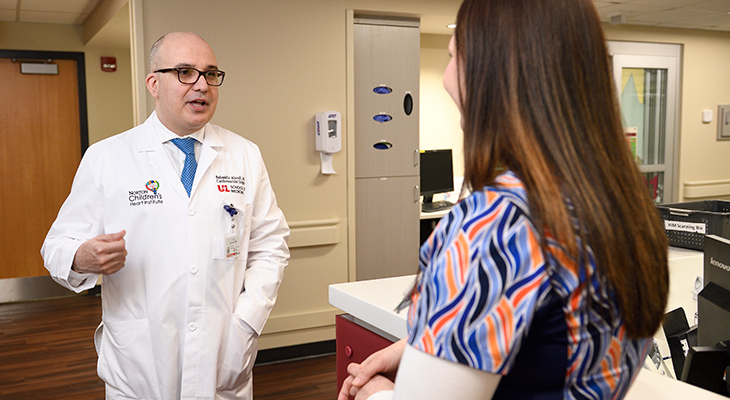 Bahaaldin Alsoufi, M.D., brings congenital heart disease expertise to Louisville | Norton Children's Louisville, Ky.
Bahaaldin Alsoufi, M.D., says that the road to becoming a pediatric cardiothoracic surgeon is a long one. He started his journey at 16, when he first vowed to become a heart surgeon. After earning his medical degree in Syria, he spent 24 years training and building his career at universities and hospitals in the United States, Canada and Saudi Arabia. He brings his expertise to Louisville as chief of pediatric cardiac surgery for Norton Children’s Hospital and the University of Louisville School of Medicine. He also is co-director of Norton Children’s Heart Institute, affiliated with the University of Louisville. Dr. Alsoufi’s expertise comes from 10 years of training in the U.S. and Canada and subsequently working at two very busy pediatric cardiac surgery programs, starting at the King Faisal Specialist Hospital & Research Centre in Saudi Arabia. In 2013, Dr. Alsoufi moved to Atlanta, Georgia, where he worked at Children’s Healthcare of Atlanta, one of the biggest and busiest pediatric cardiac surgery centers in the United States. While an associate professor at Emory University in Atlanta, he gained clinical experience caring for children and adults with congenital heart disease as well as doing clinical outcomes research. “Working at two large, experienced heart centers allowed me to mature at a fast rate in clinical and operative experience,” Dr. Alsoufi said. Dr. Alsoufi’s interest lies in treating the most complex kinds of congenital heart disease in children, especially newborns. According to Dr. Alsoufi, newborns make up about 25 to 35 percent of patients receiving treatment at experienced pediatric heart programs. Dr. Alsoufi treats congenital heart defects such as single ventricle defect, aortic valve disease and mitral valve disease, as well as heart transplant patients. He is drawn to the evolving research around these conditions and the fact that outcomes for these children continue to get better and better. Dr. Alsoufi has been active in clinical outcomes research during his career. He has led dozens of projects cited in about 150 publications. Dr. Alsoufi’s interest in research stems from generating clinical questions that he and his team can investigate. “It’s not only helpful for me to find an answer for myself, but also for other physicians involved in caring for those type of patients,” he said. Dr. Alsoufi has published research on many of the complex conditions he treats, including single ventricle defects, aortic valve disease in children and the Ross procedure. He published series of articles on aortic valve disease and mitral valve disease in children; his papers frequently serve as a reference on valvular heart disease in children. Dr. Alsoufi published one of the first large series of articles on extracorporeal cardiopulmonary resuscitation (ECPR), which is the use of rescue extracorporeal membrane oxygenation (ECMO) support in children with refractory cardiac arrest who are not responding to chest compressions. Some of his papers are key references in that field. He’s proud of technical papers that describe modifications of surgeries that treat congenital heart defects. He has published papers on the hybrid Fontan procedure, sutureless repair of total anomalous pulmonary venous return and modified Norwood procedure. Adults with congenital heart disease is an emerging population thanks to the successes of pediatric heart surgery, according to Dr. Alsoufi. More adults are living with congenital heart disease than children in the U.S. (1.4 million adults, 1 million children), according to a 2010 study. According to Dr. Alsoufi, congenital heart disease is a lifelong disease, and children who get surgery will need heart care for the rest of their lives. Many will need future interventions, including surgery. Some may need to have surgery five, six or seven times over the course of their lifetime. Dr. Alsoufi is proud to continue his path as a physician in Louisville. Norton Children’s Heart Institute has the team approach needed to provide care for complex heart conditions so that children and their families can stay close to home while receiving care. After treating over 3,000 patients during his career, he’s excited to take on new challenges as part of his new role as co-director of Norton Children’s Heart Institute.